The announcement today that Google are to include Sustrans cycle routes alongside other transport modes is welcome confirmation that cycling is becoming more mainstream. Pitching the various transport options side-by-side will allow people to discover that, for instance, a 3-mile journey across a city can be much quicker to cycle than to drive. Making cycling an equal player helps people discover their local cycle network and help make the case for greater use of bicycles. It is genuinely heartening to see that, 7 years on from the creation by Cambridge Cycling Campaign of one the first-ever cycle journey planners, that this concept has moved on so much. Indeed, that precursor to CycleStreets that we created used version 1 of the Google Maps API. Google joining the peleton of websites that show National Cycle Network routes, such as CycleStreets, OpenCycleMap and OpenStreetMap, is another step forward in recognising the existence of the ever-growing cycle network of the UK. 2005: The launch of Cambridge Cycling Campaign’s journey planner, which later become CycleStreets – how things have moved on! It used the Google Maps framework. The last few months have seen a big resurgent movement of people wanting to see better cycling conditions around the UK. We couldn’t let this pass without some brief comment! The Times newspaper has been running a fantastic campaign, Cities Fit for Cycling, which has massively raised the profile cycle safety issues, with its 8-point manifesto that echoes many of the key issues often raised by cycle campaigners. As a search for #CycleSafe on Twitter will show, Cities Fit for Cycling has really captured the imagination and interest of cycle campaigners – and increasingly the general public – around the UK, and especially in London. A series of articles has really upped the pressure on decision-makers, leading to parliamentary debates, and London Cycling Campaign have helped pile on the pressure by organising The Big Ride. Through our own project Cyclescape we are hoping to enable the enthusiasm of campaigners to be facilitated more at a local level. This summer sees the Summer of Cycling. It’s a great opportunity to encourage someone you know to get on their bike! The Summer of Cycling is a national campaign running this summer which aims to encourage more people to cycle. The All-Party Parliamentary Cycling Group and The Bicycle Association, alongside the force of 23 cycling organisations are aiming to double cycling this summer. London is seeing a resurgence of interest in the idea of Going Dutch, thanks to cyclists led by London Cycling Campaign, of which we are proud to be members, and others. LCC have done a brilliant job over the last year in challenging decision-makers to do better in places like Blackfriar’s Bridge and Parliament Square, and to do what virtually no other group has done, and actually showcase actual alternative designs, putting forward a wonderfully positive agenda. From our own experience in cycling around the Netherlands, we know how much this would benefit every Londoner, and so we fully support LCC’s efforts. 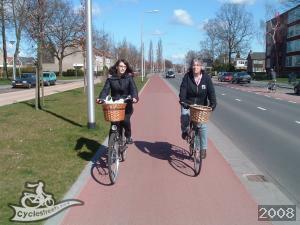 Have a look at more Photos from the Netherlands in our Photomap, some of which were from our own trip with Cambridge Cycling Campaign. We hope some of the above will inspire you to get more involved, wherever you are! Friday 21st January 2011 saw a short Adjournment Debate in the House of Commons on the subject of "Cycling in England". A question was raised as to the government's support for use of tax money (£2.4 million) on the TransportDirect cycle journey planner when CycleStreets (£28.1k spent) already exists. This debate on cycling was secured by Julian Huppert MP, a long-standing supporter of cycling. His excellent speech covered a range of issues – many of which are raised by contributors to our Photomap – such as the issue of poor signing of contraflow streets, parking in cycle lanes and pavement parking, lack of cycle parking at stations and much more. "If I may finish on a suitably austere note: Other cycling enthusiasts have noticed, that the Government, in its Sustainable Transport White Paper, plans to spend more money on developing its own cycle journey planner. In the spirit, perhaps of the Big Society, could I point the Minister and her Department to the CycleStreets website, which already provides such a service, reliably and efficiently, and without requiring millions of pounds of government subsidy. The website was developed by two of my constituents, both avid cyclists, very much involved with the excellent Cambridge Cycling Campaign, and it cost a total of around £40,000 to cover the whole country. I hope the minister will consider the value for money of supporting and utilising their work, rather than inventing a new wheel. I look forward to her comments. Thank you." "My Honourable Friend for Cambridge concluded his remarks by expressing a degree of concern about the DfT developing its own cycle journey planner when websites, very good websites like CycleStreets, are already available. Well, I think, given the importance of this issue there is room for government action in this area to complement the websites provided by the private sector, particularly with our focus on giving novice cyclists the information they need to encourage them to go out cycling, so they've got the confidence that they can identify, able to identify, the easier and the safer routes." As we recently wrote, rumours are circulating that the government’s cycling body, Cycling England and its excellent initiatives such as Bikeability, may be axed due to government cuts. These rumours are getting stronger by the day. We think shutting down Bikeability and Cycling England would be disastrous for the future of cycling in the UK. Like many others, we urge everyone to write to your MP urgently regarding the points in that Open Letter. We are alarmed at the news that Cycling England may be facing the axe, and that the future of the excellent Bikeability cycle training scheme and other important initiatives is therefore uncertain. Cycling England is the arms-length agency of the Department for Transport which deals with cycling. 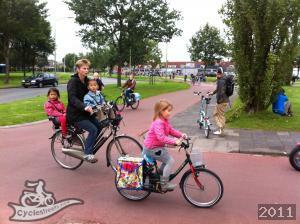 Its remit is to get "more people cycling, more safely, more often", something we feel it is achieving, and very well. Since its formation in 2005, Cycling England has triggered a wave of initiatives to get more people on their bikes. Cycling England's premier initiatives, the Cycling Demonstration Towns, and Bikeability cycle training have shown what can be done when dedicated practioners put real resources and effort into promoting cycling. And its work on technical standards for design have been useful for campaign groups around the country. The amount of funding for Cycling England is absolutely tiny in comparison with other transport schemes such as road and rail initatives. Its budget has been £160m in total for the three-year period leading to 2011. And Sustrans' work on economic appraisal has shown that benefit:cost ratios for cycling schemes are between 15:1 and 33:1 – that is, for every pound put in, some £15-33 pounds of benefits come back. Road/rail schemes produce nothing like that level of return. Yet this level of around £50m/year is well under what places like the Netherlands spend. So there is much more that could be done. Cycling England is not a full quango, and employs only around 5 people. However, this tiny number of employees effectively have acted as catalysts for work to improve cycling by a much larger number of people 'on-the-ground' and in Local Authorities. As a 'lean' organisation, one which is well in touch with local initiatives, and an organisation which we feel has acted in a creditably open and accountable way, it should be a model of an organisational structure for government. 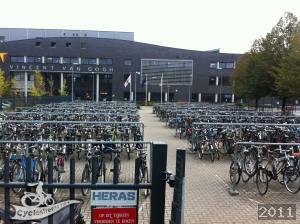 And being a dedicated organisation at arms-length, it has had the ability to focus on cycling. Cambridge, the home of CycleStreets, is one of the Cycling Demonstration Towns, and a variety of long-needed improvements to infrastructure have been made, including on Gilbert Road, Hills Road Bridge, and links to villages. Cambridge, like many other areas, is also seeing considerable success with the Bikeability cycle training scheme. The Cycling Demonstration Towns have seen increased ridership and many other successes. Cycle training for children and adults has been transformed under Cycling England. The former 'cycling proficiency' schemes often failed to train people in real-life traffic conditions, with non-cyclists sometimes doing the training. By contrast, Bikeability has been run in a professional manner, marketed well, with huge uptake by children, being taught valuable road-safety awareness early in life, giving then much-needed freedom. Cycle training at an early age must surely have the effect of creating better and safer drivers later on in life. Perhaps the only area which Cycling England has faced any significant criticism is its fledgling journey planner, through an FoI request. As we have previously commented on our blog, we have no real comments to make ourselves on that, believing that people can judge for themselves. But this smaller initiative aside, Cycling England has been responsible for a big step forward in starting getting the UK cycling again. The government must, we feel, back up its commitment to the environment and public health by retaining Cycling England and by repeating a similar level of funding (around £50m) for each of the coming three years, which would fund projects UK-wide. This amount represents a tiny fraction of merely a single road scheme. Yet the benefits to society and the environment of getting more people cycling are immense: not only environmentally, but also in terms of reduced congestion (and thus a more efficient transport network), improved health, fewer accidents, and more. Cycling is also highly accessible to a large number of people, and can thus help with accessibility in economic and social terms. We urge everyone reading this to write to their MP to ask him/her to write to the Department for Transport and the Coalition government to keep Cycling England, repeat its funding, and thereby to demonstrate much-needed commitment to cycling. This is a guest post from Alex, creator of Cycle Hire App – for the London cycle hire scheme, who is using our routing interface in his app. We asked him to tell our readers about his app, as it's one of our favourite apps of the seven(!) that have been released, and that's not just because it's using our routing API – it's very polished and has a wonderfully clean interface with some innovative ideas! The use of an offline map is also a great advantage. It was also the first to be announced. Hi there, this is Alex, designer & developer of Cycle Hire App. As we've just released the first version of the app in the app store (http://bit.ly/getcyclehireapp), I'd like to take a moment to introduce the app and thank CycleStreets for opening up their service for mobile apps like ours. I built this app (and I'm giving it away for free) because I want to help people in London who like cycling. That's why when I started work on the app a couple of months ago, I integrated CycleStreets as a way to help those who wanted to use the cycle hire scheme but weren't familiar with the road network in Central London. Unlike the directions offered by Google Maps, CycleStreets/OSM knows about cycle paths & all sorts of shortcuts for cyclists, e.g. when you can push your bike along a pedestrian path for a while, instead of cycling around a block. We're looking forward to working with CycleStreets as our app evolves, and we'd love to help them improve their online service and their own iPhone app. Apart from the flexible routing, the app has all sorts of ways to help people find docking stations, such as searching around tube/rail stations and tourist attractions. There's also a postcode search, which is based on the recently released OpenData from Ordnance Survey. When you find locations that you frequently use, you can save them in your 'Favourite Locations' list for easy access. I also wanted this app to be the most user friendly out of all the other cycle hire apps out there. This means giving as much space as possible to the map, making sure all functions are accessible with a couple of taps, and focusing on making the app very fast (after all, who wants to stare on an iPhone screen when they could be on a bike?). One way we made the app faster is by pre-loading all the maps. This means no endless waiting for the maps to load when you've got a bad signal. As a bonus, the maps also work when you're underground with no signal, or if you have an iPod touch. Cambridge resident and democracy activist, Richard Taylor has written today about a Freedom of Information request he made recently on the subject of the government’s efforts to create a Cycle Journey Planner, available through the Transport Direct portal. For the avoidance of doubt, Richard is not involved with CycleStreets, though our database shows he has a user account. We cannot let the outcome of his FoI request go unmentioned, as it overlaps with some of our own interests in open data and cycling community issues, and his blog post makes comparisons with our own system. The relevant documents are worth reading. They outline the request that Richard made, followed by the response from the Department for Transport. It is a credit to the DfT that these detailed documents seem to have been issued in response to the Request without sign of any resistance. We hold the same view with respect to any system, including government-based ones. We have no complaint about the existence of competition. We also support the principle of multi-modal journey planning. The idea that someone asking for directions could see cycling amongst options as part of their overall journey, e.g. from a house in Cambridge to a London train station, that includes cycling to the station, is a good thing for making cycling the mainstream activity it is and should more widely be. Multi-modal planning could of course be achieved through an API approach also (though we have never approached Transport Direct on that suggestion). The issues raised in the FoI request by Richard Taylor, as we interpret it, are however different ones to that of competition. 1. The question of spending public funds on systems which compete with commercial and community-based systems that are achieved at much smaller cost to the taxpayer. We are taxpayers ourselves, and we have a valid interest in ensuring that our taxation is spent efficiently. It is perfectly valid for government to be running services of various kinds if they are useful and provide value for money. Our only comment here is to present the facts and leave others to make their own judgements. Figures for the government system are stated above in the quotation from Richard Taylor’s blog above, and total £2,383,739 by the end of the 2010/11 financial year. In terms of usage, according to their own papers, “Usage of the [Transport Direct] planner remains very low” (Programme paper, 12/Feb/2010), at 23,608 journey plans. Our own project has been achieved at a cost of under £12,000; however, time spent has been completely unpaid (which is not sustainable; we would like to be able to pay 1.5-2.5 salaries for the coming 12-18 month period and are seeking funding to enable CycleStreets (which is set up as a non-profit-making entity) then to be self-sustaining). Some 76,107 journeys have been planned in what is still our beta phase – during which we are deliberately not promoting the system heavily while known problems are ironed out. An additional 47,000 journeys were planned on the previous Cambridge-only system. 2. The involvement of communities within government-led initiatives. In our view, the success of any cycle routing system will in large part be dependent on the level of involvement it harnesses from the cycling community. The latter is something we are certainly working hard on, and it is an integral part of our system. Much of the data in OpenStreetMap data has been surveyed by cyclists, and cyclist involvement remains key throughout many aspects of our project, though we know that we always have more to do. 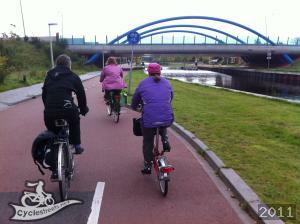 CycleStreets would have been impossible without cyclist involvement. It was originally intended that the cycling community would be one of three sources of data for the Transport Direct project (the other two being Ordnance Survey and newly-commissioned surveying to fill in the gaps in OS data). We know this because were early advisors to the Transport Direct project at a much earlier stage of their project, and attended a meeting where they decided this. We were invited to attend because, having created one of the very first ever online cycle journey planning systems in the world, in the form of a precursor Cambridge-only system, we were recognised as having expertise. Sadly, it is clear from one of the documents released in the FoI publication that the cyclist involvement aspect has been “deferred indefinitely” (Programme minutes, 17/Feb/2010). 3. The Open Data debate: availability of data which is collected at taxpayer expense. If we have any fundamental issues with regards to the Transport Direct project, it is this issue. As is clear from our own views on freeing of Ordnance Survey data, we are strong advocates of open data approaches. As individuals, we believe in the fundamental principle that data collected at taxpayer expense should be freely available in return. Doing so means that anyone who wishes to use such data can operate on a level playing field, creating competition and innovation. This is an issue which we raised last summer with a contact we have at Cycling England (who to some extent are constrained by national policies on Ordnance Survey data, something which is at long last starting to change). Government spending tax money to create a dataset usable only with a license payment, but which is competing with an open dataset is a somewhat unsatisfactory state of affairs in public policy terms. In this regard, we do feel it is unfortunate that Cycling England authorised and paid for the surveying of (for instance) Cambridge cycle-related data surely knowing that such surveying had already been done to an exceptionally high standard by OpenStreetMap volunteers, although we acknowledge this is a necessary corollary of competition by a system based on Ordnance Survey data rather than open/varied data sources. Concluding, these three themes do not change the fact that CycleStreets has to compete on its own merits, as it should. We are proud of our own product. We do not claim it is perfect, and the deficiencies we know about (principally routing which sometimes is either over-wiggly, over-busy, or slow) are things we are working hard to solve, despite meagre resources to do so. Both of the principal developers of CycleStreets are fans and active advocates of the work that Cycling England more generally is doing, as we know through our roles elsewhere as campaigners that it is achieving results. Cycling England’s flagship Cycling Demonstration Town and Bikeability programmes are excellent. By raising standards and aspirations, these have achieved enormous benefits for cycling, at relatively low cost compared to many other government programmes. It is extremely important that these successful initiatives continue to be funded – and indeed that funding for them is increased – following the general election. We should acknowledge that Cycling England is amongst a range of bodies to whom we are finalising approaches for core funding for CycleStreets, so that our project can then run on a self-financing, stable footing. Our remits of promoting cycling are clearly well-aligned. Naturally we will report back on any successful funding outcomes, as we have done with our other smaller grant applications. Easter came early this year! In the last few days there has been a blaze of activity around the long-awaited changes by the Government to the way the Ordnance Survey’s data is controlled. A significant number of its excellent datasets have been freed up, which we think is excellent news for the UK geographical community. The principle at stake is whether collected at public expense should be available to the public (including businesses) free of charge. This is a principle increasingly being accepted in the UK, through the launch of the excellent data.gov.uk and London Datastore portals, and throughout the US where public data has long been freely available. This change – strongly welcomed by many in the web mapping community – follows years of pressure by the Guardian’s Free Our Data campaign, and by many others who, like us agree that public data should be public. Although Ordnance Survey data collection/management is partly also paid for by license fees (many of which come from Local Authorities, i.e. from the government anyway! ), ‘the Cambridge Study’ effectively argued that freeing up such data and paying the remaining costs through taxation would lead to increased taxation from businesses who are able to create innovative uses of this data. The quality of Ordnance Survey’s data has a reputation as being amongst the best in the world, and it is important that government funding remains so that quality remains high. Furthermore, it has also been argued by some (ourselves included) that making data open means that private/community-sector groups can more cheaply and quickly create products that traditionally the government would spend millions creating in a ‘top-down’ fashion. As community-based social entrepreneurs, we believe that community-led projects are more likely to work most effectively. An example of this is our own project, CycleStreets, which has been achieved at a fraction of the cost of the Government’s Transport Direct project that is competing with us and whose costs, usage levels, and restrictive data access terms have just been revealed as a result of a Freedom of Information request. One issue which many respondents to the government’s consultation raised is the problem of ‘derived data’. This is the way that the Ordnance Survey’s license believes that placing your own data over one of their non-free datasets, e.g. overlaying a set of crime points, gives them rights over your data. (This is a different issue to wholescale tracing of non-free maps, which is indeed copying.) The Ordnance Survey’s rules effectively create lock-in, because having overlaid data over a dataset, it then becomes non-portable to use elsewhere. This kind of restriction is unacceptable in a world where web ‘mash-ups’ are widespread and where there is ever-increasing competition. Issues relating to derived data have yet to be tackled, but the consultation response acknowledges that this needs to be tackled. We moved our own postcode finder to the OS Code-Point database within hours of it being released, and we believe we are the first public user of OS Free data (albeit only for postcodes). Some of the new OS street data may well make its way into OpenStreetMap (whose data CycleStreets uses). The new data will surely help OSM achieve completion of UK street data more quickly, as there are still areas of the UK where OSM data is not sufficiently complete, though that is changing rapidly. CycleStreets currently suffers considerably from the lack of even basic data in some areas still. We have no plans to move to Ordnance Survey mapping data, because the OpenStreetMap data is often richer than the data that has been released, and OSM has the benefits of being community-based. Crucial amongst this is ability for the cycling community to update and augment the data themselves.